THREE great music acts have been announced as part of the line-up on the Seymour’s Main Stage for the 2017 Party in the Park. This year’s event is marking 40 years since Woking band The Jam released their first album In The City and paying tribute to the late Rick Parfitt of Status Quo, who came from Sheerwater. Partygoers are being invited to get into the groove with a swingin’ 60s and psychedelic 70s theme and enough free entertainment to fill a pair of platform shoes is promised at the event in July. Zany six-piece band King Pleasure and the Biscuit Boys are back by popular demand to open the show. The band have been on the road for two decades, playing every European country as well as the USA. They have dazzling musicianship, riveting stage performances and also, more than 50 TV appearances and 75 radio broadcasts under their belts. Also ready to set the soundtrack for the day is the UK’s Number One The Jam tribute band, The Jam’d. They will give an unforgettable, authentic performance with all the energy, passion and style of Paul Weller, Bruce Foxton and Rick Buckler. Status Quo’s original drummer, John Coghlan, will headline, with his band John Coghlan’s Quo. 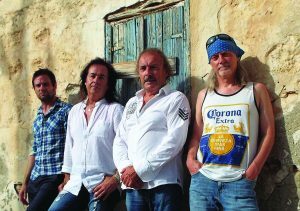 Their homage to former bandmate Parfitt, who died in December, will take partygoers back in time, recreating an authentic 70’s Quo sound and playing classics including Rockin’ All Over the World! As well as music on the Seymour’s Main Stage, Party in the Park’s Rockin’ All Over the Park’ offers something for everyone. This includes Dance Woking gathering an eclectic mix of dance, the fun-packed Children’s Zone, Freedom Leisure’s Sports Zone and shopping in the Chill Out Field. The Ambassador’s Big Screen will also be back, even bigger than film star Audrey Hepburn’s beehive hairdo. Party in the Park 2017 is on in Woking Park on Saturday 8 July from noon to 9pm. Families are invited to dig out their tie-dye fashions, fire up your flares, flick back their hair and indulge in a day of love, peace and rock ’n’ roll. For more information about the event visit www.celebratewoking.info/partyinthepark.